More Personalised Stamps™ will be added to Australia Post's line up in the coming days. The Australian Monotremes Personalised Stamps should finally arrive on 3 October, the day of the price rise, although there's no guarantee of this (they have at least turned up on the website). Unbeknown to many though was the Play School Personalised Stamp™. It was eventually advertised in the Stamp Bulletin but much later than its release date of 9 August. 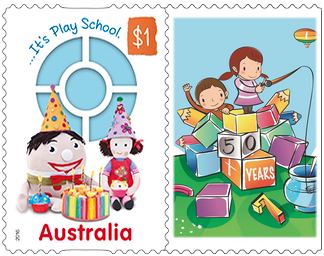 Collectors might be interested in the fact that after several calls to the ABC, I found they have given Australia Post exclusive rights to use any images from Play School on stamps or any philatelic related material. Hence, the generic '50 Years' image below. 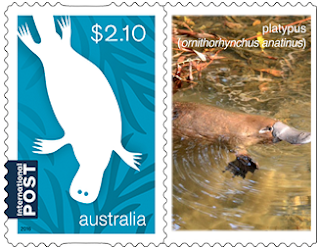 We'll need to wait and see if Australia Post issues new Personalised Stamps™ for Christmas. With the price of Christmas Cards remains at 65c, Australia Post may reuse last year's stamps. Sometimes not receiving your order from Australia Post can result in you discovering something new about the production of Australian stamps. Back in January, when the Greetings Personalised Stamps™ were released I ordered a sheet of each design. Unfortunately, one did not arrive, and after several emails back and forth a replacement sheet was sent. Interestingly this sheet was sent direct from the producer and as such did not come in the usual Australia Post A4 envelope, rather an Express Post envelope stamped on the back 'ABnote'. It appears that Australia Post has outsourced the production of Personalised Stamps™ to ABnote (part of the American Banknote Company). Leigh Mardon was sold to ABnote in 1996, and so in a round about way it appears Leigh Mardon (under the ABnote brand) has returned to stamp production. Collectors may remember Leigh Mardon was a significant printer of Australian stamps in the 1980s and 1990s, but with the rapid introduction of self-adhesive stamps (a technology Leigh Mardon did not rapidly embrace), and a re-focus on their main product, security products, Leigh Mardon exited the stamp printing business. 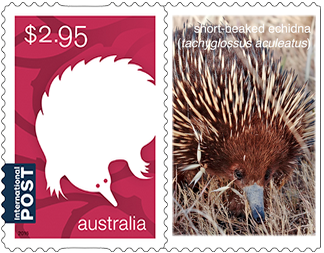 The question now is when did Australia Post outsource their Personalised Stamps™? I suspect that it happened in 2015. In early February 2015, Australia Post sold Post Connect, their variable print and mail house service to ABnote. Further digging reveals that eLetter was part of Post Connect, and eLetter for a time was also involved in Australia Post's in house production of Personalised Stamps™. Furthermore emails sent to Karen B. who managed their production for Australia Post were returned to me in late 2015.